MANILA, Philippines – The list of passers, top 10 examinees, top performing schools and related results in the July 2016 Radiologic Technologist (RadTech) board exam and X-Ray Technologist licensure exam conducted July 4 & 5, 2016 by the Board of Radiologic Technology are already available at this website as PRC officially released the results online after seven working days. As announced, 1,639 out of 3,833 passed the Radiologic Technology while 56 out of 213 passed the X-Ray Tech board exam. The licensure examinations were administered by PRC Board of Radiologic Technologist headed by the OIC, Mr. Reynaldo Apolonio S. Tisado and its members, Dr. Orestes P. Monzon, Mr. Bayani C. San Juan and Ms. Ma. Jesette B. Canales at PRC testing centers nationwide specifically in Manila, Baguio, Cagayan de Oro (CDO), Cebu, Davao, Iloilo and Tuguegarao. Update: As per PRC reliable source, results will be released latest Friday, July 15, 2016. On the same exam conducted by PRC on July 2015, results were out after three (3) working days. The schedule of online appointment for issuance of Professional ID and Certificate of Registration will be on July 21-26, 2016. The two days board exam for RadTech covered topics from Radiologic Physics; Equipment and Maintenance; Radiobiology, Radiation Protection and Quality Assurance; Image Production and Evaluation; Radiographic Procedures and Techniques; Patient Care, Management, Ethics and Jurisprudence, Human Anatomy and Physiology and Medical Terminologies; Radiological Sciences. Meanwhile, almost same topics are covered in X-Ray Technologist board exam except that the Radiological Sciences are not included. 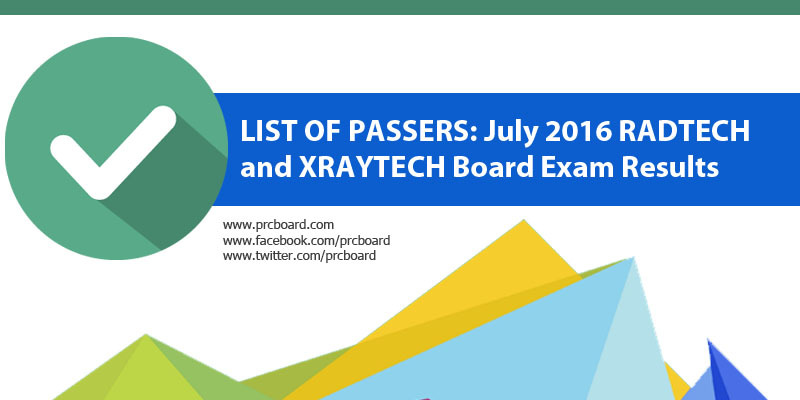 During July 2015 RadTech licensure exam, 1,325 examinees out of 3,043 passed while 53 out of 210 hurdled the X-Ray Tech. St. Louis University was the top performing RadTech school having 45 out of its 52 examinees passed or an overall passing rate of 86.54%. The top spot in the same exam were shared by alumni of St. Jude College, Dasmarinas Cavite and Cebu Doctors' University both having 89.60%. They are Patrick Deompoc Agaloos and Melanel Shine Reyes Fuentes. Meanwhile in the X-Ray tech exam, the first two places were swept by alumni of Wesleyan University of the Philippines Cabanatuan. Joyce Tierra Hillado got 85.25%, Ramon Dela Cruz Balintag Jr. and Mameth Factor Pajarillaga both got 83.50%. To receive up-to-date news about July 2016 Radtech and X-Ray Tech exam results, we advise our visitors to bookmark this page or follow us at our social media pages via Facebook and Twitter . anong oras po lalabas yung result? Natutulog pa po ang mga taga PRC kaya hanggang ngayon wala pa ang result. Just In: Next week pa lalabas ang result dahilan sa kakulangan ng tao na mag check ng mga questionnaire. Sorry po talaga. Wala pa rin pong result? Gising gising mga kapatid. halos di na natulog ang mga naghihintay ng result, pati ba naman sa paglabas ng result pinapaasa niyo kami. Guys, nasira po ang machine na nagchecheck ng mga questionnaire kaya matagal pa lalabas ang result at its confirm na three weeks from now pa mapapublish ang result. Salamat! Friday po sure na bukas. wala parin? T.T last week pa ang kaba namin. Ano ba talaga? July 15 na e wala pa ang result? What happened na po ba? Kailan po talaga lalabas ang result? Ano PRC? Kaya pa? Mga pak ganern kayo! Paasa!